This is just a friendly reminder for all of you American citizens out there that voting is, in fact, a privilege. Tomorrow marks another election cycle in our nation. One of the great things about living in America is our ability to control our own destiny by voting for those that can represent us as best as possible, and serve as a means to that end. So, I urge all of you to get out there tomorrow and VOTE! It does not matter where your political convictions lye or what others say. That, my friends, is the great thing about this country. I can mix with associates with differing political and ideological beliefs, and still keep them as friends. One does not suffer the threat of death for expressing their political beliefs, or even voting for that matter, in this country. Sure, we have accusations of voter fraud, and one may have to shuffle past Black Panther members or the Tea Party Express to get to the polls, but they are not trying to shoot you on your way to the polls. 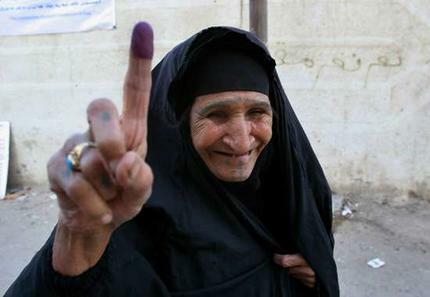 Iraq, for example, had one of the highest turnouts for their voting in recorded history. And many of these people literally risked their lives for the privilege of voting. They continued to risk their lives and the lives of their families by simply being seen by the wrong group of people with ink on their fingers. So, if people are willing to go to such lengths to vote in a country that has never experienced democracy in any form, why can't we simply drive to a polling station here and make our voices heard? If you do not vote, then you have no right to complain about the direction our country has gone. If you do vote, then you have every right to blame the President and the current administration for all of our problems. That is, of course, until the next administration comes along--then you can blame them. But only if you vote!